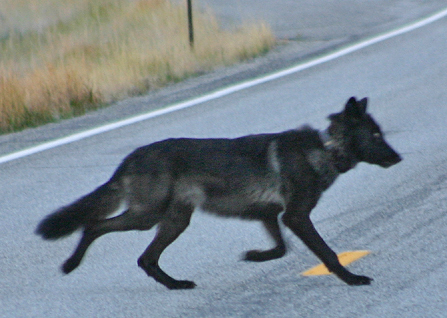 The Phantom Hill wolf pack is considered by some as Ketchum, Idaho’s own. First discovered this year, the pack has been around for more than a year, however, because it has yearlings. Its range is in the Boulder and Smoky Mountains, bisected by scenic Idaho Highway 75, about 25 miles north of Ketchum. On one side of the Highway is the grazing allotment of Lava Lake Land and Livestock, a very wildlife friendly outfit that decided not to put its sheep in this year to help the wolf pack. On the Smoky Mountain side the rancher is not progressive. Somehow they survived the summer with some help from a person hired by the Forest Service, or Idaho Fish and Game (not sure). This person’s job was to haze them away from livestock. At any rate, a lot of folks have seen them crossing the road. Lynne Stone of Stanley sent the photos below of the alpha female and a yearling. She caught them other day on her way through. 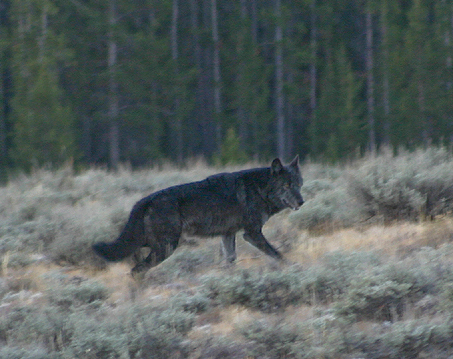 They aren’t the greatest photos, but we don’t get many photos of Idaho wolves, despite there being 700 of them. Thanks Lynne! The alpha female has a limp. Alpha female, Phantom Hill Pack. This wolf has a noticeable limp. 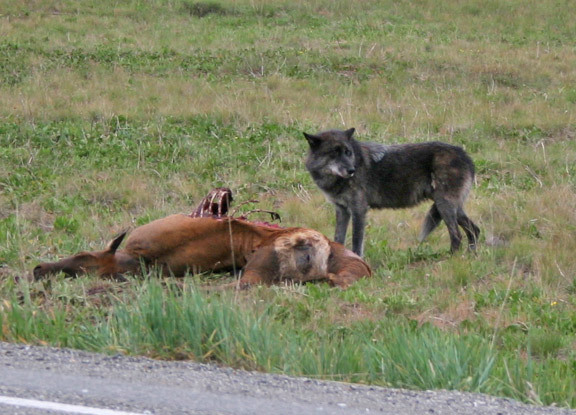 Oh, and here is another one taken in late May of one of the Phantom Hill wolves on a carcass by the highway. This attracted a lot of attention. It is the alpha male. The photographer is Claudia Fiaschetti. Yes thank you Lynne, might have to make a road trip up there to see if I can get lucky and spot them also. Thanks for posting the photos, Ralph. I know now that the wolf by the road-killed cow elk is the alpha male. He is an older wolf and has some gray in his black coat. The photo was taken by Claudia Fiaschetti. There wasn’t anyone hired to try and haze the wolves, rather a couple of volunteers stepped up. There are three sheep bands about to head out of the Sawtooth Valley and into the Big Wood River drainage where the Phantom Hill pack hangs out. The Phantom Hill wolves will need to avoid the sheep as the bands trail through…. We are having snow and some of the sick, weaker sheep are falling behind and could become wolf bait. Let’s hope the wolves don’t get blamed for taking advantage of abandoned ewes or lambs. This has happened before. If the six Phantom Hill wolves can make it through the next month, they could become the most visible pack in Idaho, living as they do next to the resort communities of Ketchum and Sun Valley. The name Phantom Hill is from a long grade on Hwy 75 about 12 miles north of Ketchum that doesn’t seem like a hill but is. Are these the same wolf pack that someone was trying to kill last year near Stanley? It is great that the wolf pack is still alive and well. Thank you for the photos!!! Wow what a beauty she is…thanks for picts. I hope she keeps off the highways. We finally have a resident griz near our place in Montana. It lives in the Allen Peak Roadless Area. As you know, very few are left in the Cabinet-Yaak area. We also have a very active pack of wolves that come and go – mostly in the winter. Also saw a wolverine last summer- didn ‘t have a camera, but saw it twice at about twenty-five yards. It was defending a deer – probably a road kill. We have also had a lot of lion company this year. They made four kills within 100 yards of our cabin. We have also had wolf kills, but they are always farther from the house. Can anyone offer advice on where to look if they took the drive up towards stanley then down to ketchum as to where one might look to find the wolves. It is always so wonderful to hear or see that a wolf has been around long enough for his coat to have aged from a black to silvertipped. The yearling is a beauty too. Chuck – right now is a hard time to see wolves as elk and deer hunting seasons are going on and the wolves are widely dispersed, cleaning up what hunters leave behind. Once the snow comes and elk move to lower ground, there’s a better chance to see wolves. My best luck comes right around daybreak. This Spring and early summer, the Phantom Hill wolves were seen on both sides of Highway 75 north of Ketchum in the Boulder Mountain foothills and Smoky Mountains. You might hear them howling when you can’t see them. Where do you live? I don’t understand where all the contrary comments are .I live in the Ketchum area and the majority of the life long friends and neighbor’s I have don’t agree with Lynn, yet I don’t see any exchange of ops here. I love all the animals as everyone here does and knows the reality of wolves in the hood yet some only have read about it.